Can the sequel be better then the first? 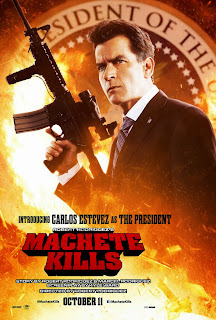 As you may remember of the first Machete movie, it was more funny then actual action. Not saying that it didn't have any action in the movie, because there was plenty. it just was so far out there that you could laugh at it. Machete Kills did have plenty of famous celebrities such as Mel Gibson, Sofía Vergara, Charlie Sheen, Lady Gaga, Antonio Banderas, Cuba Gooding Jr., and Vanessa Hudgens. This did help the film out because a lot of people will go to this film just because of some of the actors in the movie. Danny Trejo is the best machete killer ever. 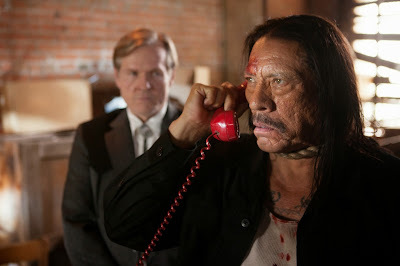 Out of all the movies out there that have any actor killing people with machete's, Danny Trejo is the best. This movie does bring back some elements from the first film, so I would recommend for you to freshen your memory and catch the first one if you get a chance. Stay after the credits for some extra funny scenes. At the start of the film, they have a trailer for a third movie. I'm not sure why they didn't but that at the end of the film. Once you see the film you will agree with me. A third film, which I doubt is going to happen, does look like it will be good. Sofía Vergara is not in the film enough. They needed to add more scenes of her in the movie.